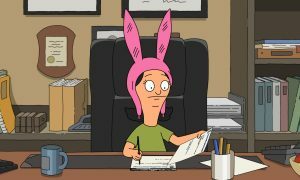 On this week’s episode of Bob’s Burgers season 9, Linda Belcher tried to set Teddy up with Helen. But, Tina Belcher became determined to set her up with a woman named Kathleen. The premise of Teddy attempting to woo different women felt like a slam dunk, but the episode was all over the place. ”The Helen Hunt” actually put very little focus on Teddy. 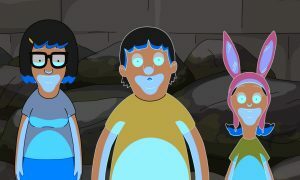 Most of the episode was about the Belchers scrambling to blend in and act like they had business at Helen’s building. Some of the bits as they lied their way into staying felt more like distractions than escalations. Part of the problem was that the episode got into over-the-top territory too often. 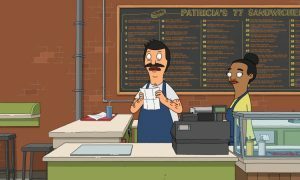 Bob Belcher and Gene Belcher both posed as plumbers rather than just leaving since they had no business at the building. Instead of the characters getting caught in an awkward situation, it crossed the line into them inexplicably creating the awkward situation. This felt especially forced since Bob is usually the least likely to go out of his way to do things. Linda and Tina playing matchmaker made sense, but the episode didn’t lean into it enough. There wasn’t a key ideaological difference to make their fight over who’s Teddy’s soulmate interesting. I wanted something specific to the characters’ worldviews to dig into. The episode also could’ve derived more comedy from Helen’s character. After all, she probably killed her husband. She’s a very weird character in own right, but in this episode she was overshadowed by the Belchers’ shenanigans. I wanted more humor and tension from her murderous past, or even just her own quirks. This wasn’t a bad episode. It had the amount of laughs you’d expect from Bob’s Burgers. But, focusing on Teddy’s awkwardness around women would’ve helped it feel more organic. Instead everyone was scrambling with motivations that mostly felt forced.